Dr. Lucas Bell, O.D., is originally from northern Iowa and graduated from the University of Iowa and Southern College of Optometry where he participated in service trips to Mexico and Belarus to provide exams and glasses to the underserved. 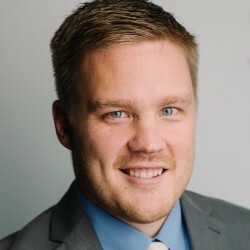 Dr. Lucas Bell is active in Journey Church in Johnston, enjoys golfing, reading, running, and rooting for the Hawkeyes. Dr. Lucas Bell and his wife Heidi, who is also an optometrist in West Des Moines,have a daughter Ruby. Setting up an appointment with one of Precision Family Eye Care’s doctors is simple, direct and painless, just like one of Precision’s eye exams. Find your doctor and make your appointment today.